Hi Alex, great to see you back. And I'll be looking forwards to seeing you in Brighton - thanks for all your work in putting posters out there. I guess you realise the dream referred to conditioning from your parents that you're likely carrying with you? I’ve not long woken up from a dream about being back at a Primal Integration (PI) group. PI is the main form of personal growth work that I’ve been doing since 2003, & is what catalysed/introduced me to spiritual development. PI is very like Primal Therapy, but is also open to spirituality & spiritual exploration. In the dream there was also a link to Glastonbury, which is why I’m writing about this here. I was walking across Glastonbury Tor to get to the group. There were lots of other people on the Tor. I’m wondering what this dream is telling me. 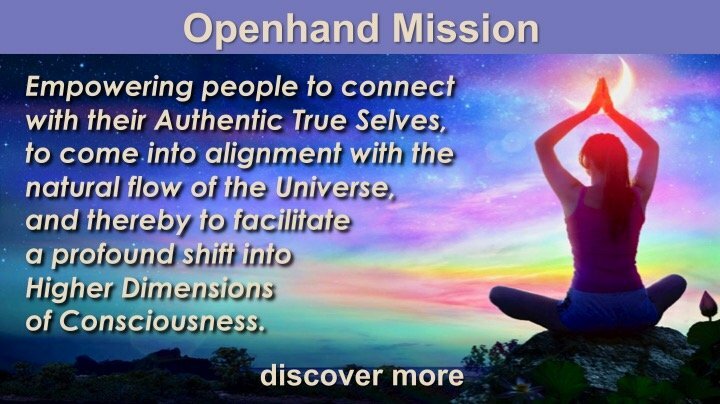 I’ve been allowing myself to sink more deeply into my emotional pain in recent days, using the Openhand model of allowing my pain rather than resisting, avoiding or distracting myself from it, in order to unravel & unwind it. I’m still not able to "dive fully" into my pain, which has been suggested to me by Open & by others in the past, but that doesn't seem to work for me because my psychological defences (against experiencing the full force of my deepest pain & trauma) are too strong & need to be dismantled slowly & carefully. I know that I'm preparing myself for the Paradigm Shift Intensive in Brighton starting in 9 days time, & that this dream is part of that preparation or anticipation. I will mull over it some more & perhaps post again later. Working with the heart chakra? As you might know, the Glastonbury Tor has been considered by many as being the centre for the heart chakra of the planet, through which karma processes. So possibly you're being invited to work with the heart chakra - leading to the activation of karma. If that resonates, I would suggest breathing into the heart chakra and relaxing in. See what then unfolds. I attended the 9am session of the Paradigm Shift webinar on Saturday. One of the questions that Open asked was “What is there to be afraid of?”. I know (believe) that ultimately there is nothing to be afraid of, but in my human experience I do have a lot of fear at times, which often feels very debilitating or even paralysing. In preparation for the Paradigm Shift Intensive this weekend, I thought I would name the top 3 fears that affect my life presently. 1. Getting it wrong. I know at one level that I can’t “get it wrong” that everything is a learning experience (or growth opportunity), but at a FEELINGS level I’m often paralysed by this fear, that I’ve got to get it right, do the right thing (according to some expectation that I have, or have been conditioned with) or else something terrible will happen to me, or I will be made to feel really bad. It’s a “treading on eggshells” type of fear. I know where this comes from in my past, but having that knowledge doesn’t always stop the fear. 2. People. This may sound strange, but I have a deeply held fear of other people, that they will attack me in some way, through criticism, shaming, judgment, humiliation or that I won’t be welcome or accepted by them, that I won’t fit in, or that they will make me feel bad. I know that this is irrational, & that ultimately no one can make me feel anything, that I am responsible for creating my own feelings, but the fear is there & I often end up avoiding people or isolating myself as a result. 3. Facing (remembering) my deepest traumas. I have a lot of awareness of what these are, & how & when they happened, but I have great fear about allowing myself to remember the full force of those experiences (or as Open might put it, to “dive into my pain”), as if in doing so I would be destroyed, annihilated, engulfed by something utterly unbearable, that would destroy my very being, my very essence. These are the psychological defences that I referred to in a previous post. I have blocked out a lot of these memories from my conscious mind. To give an example, I had a serious skiing accident in 1984, where I lost control at high speed & ended up dislocating my left hip & having to spend a year on & off crutches. I remember skiing fast, before I lost control, & then I remember sitting in the snow in a state of shock after the fall, but I’ve no recollection of anything in between. Losing control, taking the tumble, & the impact or wrench that dislocated my hip must have been terrifying & very painful, but I have blocked that memory & trauma out, presumably to protect myself from it. I do know that by blocking these traumas out & not allowing myself to remember or feel them, I am giving great power to them & preventing myself healing from them. So in that sense, if I were able (or willing) to dive into my pain, I could release myself from the hold they have over me, I would be liberated from them, I would set myself free. That’s what I would like to do, what my soul is yearning for, & perhaps I am now ready to take that step. An eminient psychoanalyst once said to me “You are ready to end your therapy when you can tell your full story” ie when you have come to a place of full honesty & acceptance of your life history & experiences. That sentence resonated powerfully & has stuck with me, & I felt prompted to share it here. Hi Alex - it's great that you share your fears here. I'm sure many have had similar. I know where this comes from in my past, but having that knowledge doesn’t always stop the fear. That's right. Because the fear will have impacted at a biochemical level - forming fixed neural pathways and emotional conditioning that infuses the bodily cells with the chemical response to the fear. That's why there has to be a 'feeling in' approach - basically confronting the situations that cause the reactions. Then to surrender into them with acceptance and trust - this is how they can then unwind over time. It’s been nearly a month since I attended the Paradigm Shift 2 day intensive in Brighton. It’s had a profound impact on me & has stirred up a lot of issues. I’ve had some physical reactions subsequently, which have been part of the outworking, part of the processing & integration of the intensive, which have been unpleasant but which I’m trying to understand & accept. I developed an eye condition called Posterior Vitreous Detachment (PVD) in my left eye 9 days after the intensive finished, which initially caused reduced vision in that eye & therefore an imbalance of vision between my 2 eyes. I have since found out that PVD is a natural part of the ageing process (I am 54 years old) & my eyesight is now returning to normal as my brain adjusts to the new physical configuration in my left eye. In the last week or so I have also come down with a moderate cold, sore throat & chesty cough, which at first wasn’t too bad but has recently worsened & I’m having to take time off from work. In general I have good physical health & a strong immune system, so when I get a heavy cold I know that my body is telling me to rest, that it needs time to clear something out, usually of a deeper, emotional, psychological or spiritual nature. I believe that I have been processing a lot of karma from World War Two since the Paradigm Shift intensive, & I will write about that some more in a subsequent post. Hi Alex - yes indeed, where it's time to come up, karma will activate and can create physical sumptoms as you describe. As we talked about, it's always looking to see what that's inviting - how does it invite us to surrender? I've seen people go through all manner of physical ailments which then completely cleared as the karma cleared. Not always easy I know, but we are here to process karma and with each breakthrough, new gifts and expansions enfold. Thank you for sharing your experience StarHawk (Alex). I actually wrote a fairly long and detailed response to a bunch of things you said, even with some questions, but then I tried to "preview" it and it all went away to the ether, lol! I decided that the Universe was calling for a more succinct reply ;) I want to thank you for sharing so vulnerably and mentioning the physical ailments that you have suffered. I went to the recent intensive in New York and was supposed to fly on to South Carolina for a few weeks directly after the trip. It is a good thing that my plans were changed by the Universe as I had a couple of VERY rough weeks and had to sequester myself from the "illusion", go through some major breakthrough work, became extremely ill (even with fever), slept, meditated, cried, read, sat in silence, cried, read, meditated...on and on until I felt better, then danced, then did yoga, mediated some more, watched some videos on this site and finally came out the other side and began making change happen in my community and at my job. I also reached out to my beloved ones, my loved ones and shared a little bit about the freedom I am experiencing as a result of the breakthrough process. I made this video for them and thought I would share it with you as well. I specifically want to respond to your #2, where you said " This may sound strange, but I have a deeply held fear of other people, that they will attack me in some way, through criticism, shaming, judgment, humiliation or that I won’t be welcome or accepted by them, that I won’t fit in, or that they will make me feel bad. I know that this is irrational, & that ultimately no one can make me feel anything, that I am responsible for creating my own feelings, but the fear is there & I often end up avoiding people or isolating myself as a result. " I think the number one gift I wanted to share with my loved ones addresses this very issue and I hope you take a few minutes to see if it helps you at all. Of course, I have zero attachment to whether or not you watch it, but I feel to offer it would be my highest good that I can offer you. Either way I am very much looking forward to hearing more about your journey as it unfolds and I am interested in your World War II journey as well. I hope you will continue your sharing and I will try to do the same when I can. It's utterly amazing the breakthroughs we witness when there's the courage to really become as-one with what has been pushed down over the years, then to become The One through it, whereupon the karmic attachments break and the soul is liberated through. It was so marvellous watching you dancing freely in New York - such a sense of liberation emanating from you. It was a privilege to be a part of your process. Thanks for your post AphroHeidi & for sharing the YouTube link, which I’ve just watched, or at least the first 7 minutes of it. I easily get overwhelmed (which is my “stuff”, & not a reflection on your YouTube) & decided to stop watching when the overwhelm feelings started. I will write another post shortly. Following the Paradigm Shift intensive in Brighton a month ago, I’m continuing to process & integrate my experiences from that. I'm getting over my cold, but in the last 24 hours I’ve been getting some more lower back ache, which for me signifies anger from a long time ago that I’m stubbornly holding onto. As I’ve shared before, I have huge difficulties & issues with unforgiveness, of others & of myself, & a tendency (or even an addiction) to holding onto resentments, emotional pain or other “negative” feelings. Writing that out just makes me feel worse. It intensifies my emotional & physical pain, & starts bringing up anxiety that I’m never going to get better, never going to get well, never going to be free of this negativity & pain. When in such feelings, I want to lash out at others, to hurt others or to hurt myself, to blame others or to blame myself, & I start having feelings of hatred towards others, the world & myself. I’m scared of these feelings of hatred. I’ve heard that hatred is a corrosive emotion & that it’s best not to focus on it or to allow it too much. I’m scared that if I allow myself to feel my hatred I will become consumed by it & will lose my capacity to love. The Openhand model talks about softening into feelings, rather than trying to drop them like hot coals. If I was to soften into my feelings of hatred, that would take me to a dark, vengeful, destructive place. I’m now getting images from World War 2, in particular the battles between the Nazi army & the Soviet army, where there were massive amounts of hatred, destruction, reprisals, slaughter of civilians & a “scorched earth” policy on both sides. Hitler & Stalin hated each other immensely. They were each other’s nemesis. I sometimes don’t understand why I’m so full of hatred & what to do about it. I’m not sure whether to try to stay with these feelings of hatred some more, or to consciously move away from them, to focus on love, gratitude or more “positive” thoughts & feelings. I felt to drop a line here, I was actually drawn to share with you in response to your post by the felt images of connection we had dancing at the Brighton intensive and then Open mentioned about Aphroheidi dancing freely at the NY retreat and I thought great sign/synch, thats exactly how I felt you moving with 'your stuff': moving through, creating spaciousness, breaking through the resistance little by little. The physical symptoms after the intensive are the by-product (medals) of the great work you did there! I honestly feel that you were awesome! I find the wisdom of body consciousness to be immense. For me, its the foundation of the inner work we do and at the same time, the paradox is that it calls for its freedom too: to go beyond it, beyond the physical. By being fully in it! Thats how it feels to me. Like you, I have over the years had karma moving through the physical (intense flu symptoms, sacrum pain, heart ache, shore throat and more recently a VERY active kundalini that brings interesting invitations!). It seeks to flow through and free itself, so the invitation is to allow it, to let it be. Ultimately, ALL seeks resolution, freedom. And on a final note, I find myself when i am processing to get overwhelmed by things. Now, for me, its a sign that my wisdom says 'look inside', thats where the answers are! Trust yourself. So, to me, its not something to override or judge but a friendly feeling/sense that what serves me right now is to drop into the unfolding of my own, unique experience (no matter how unpleasant it is) and trust in that. That's where the truth is. I would say there's something else to consider that we also apply in the Openhand processes, that you've been a part of - and that is balance. When I'm working with people, I'm working with a sense of how deep it is right to go at that particular time, considering people will have plenty of karma to process and it can't all be done in one go. For many people karma will be a lifetimes journey, with plenty of processing and breakthroughs along the way. You can't climb the mountain in one leap! That's why we'll take people into their stuff, yes, but then bring them through the other side and in equal measure feel the lightness and mainstream connection of soul. If you go into something as deep as hatred, it's essential to be the witnesser of it too - so you're present with it, not projecting it outwards. "Softening in" doesn't mean jumping in! It means going to the edge of the comfort zone you feel, and then easing yourself into the first layers of discomfort, then working with that. When you perceive you're at your limit, then it's time to work by connecting with mainstream of soul, and releasing endorphins for example. It might also help to reflect the love your'e receiving here and from the people who worked with you. Hi Alex, I feel your pain. You know that one of the best things that has happen to me was the introduction to Openhand. This will sound like it's about me but I hope it is about you as well and others here and out there. After the last month travelling across Canada, twice, I developed stomach problems and really bad. I told myself that I knew it would happen and I would deal with it when I get back home. By the way I figured it out, that home is were I am and that everything I need is at home. Man did I hated, not being understood or accepted. Not for what I was doing but for my beliefs. dealing with the pain and trying to project my beliefs was just a different kind of pain. Like you being at the edge of the clearing and being pulled back in to all that is wrong. One of the thing I did notice through the trip was that when I looked at the pain I was going through and still am, that there was peace and beauty in there too. The closer I got to the place I live the worst the pain got. You know Alex being away from Openhand, that place where I felt understood was missing for a time. It was still with me even without the web. Alex what gets my back up against the wall is family. For some reason all the other things going on or has gone on, does not. what happens to the people, animals, the planet at the hands of humans does make me sad. But I try to stop at that feeling. Being aware of the sadness with non-attachment. I know that if I attach to the sadness I can easily turn it into hatred. I thank you with all my being. Thanks for everyone’s comments & replies which I found most helpful & uplifting. I’ve been doing a vast amount of processing since the Paradigm Shift intensive in Brighton, most of which has been very necessary & helpful. However, I feel that I’ve reached the point that any more deliberate digging, exploration or unwinding is starting to become counterproductive, in that I seem to be drowning myself (perhaps even wallowing) in negativity, unhappiness, pain & misery - which I know I have an unhealthy addiction to. I particularly liked Aspasia’s comments about her memories of my dancing at the intensive, & Open’s comments about balance & suggestions about how to boost endorphins. I don’t work on Mondays so today I will deliberately do some things that I enjoy, that will uplift me & give me a boost, despite the lower back ache that I still feel. Today will be a day of enjoyment & consolidation, & I will stay away from unnecessary pain or “negativity”. That brings some sadness as I type that last sentence. I know that I am grieving various losses & I need to be careful not to squash or deny my grief, but to make at least some time & space for it, without becoming overwhelmed with grief today. I'm also feeling fragile, lonely & vulnerable, so I need to exercise a lot of self care today, before I go back to my driving job tomorrow. What might the truth be in a distortion like hatred? Good that the approach is helping Alex. When you wish to get back into this particular inquiry, work to contemplate what's the core truth within the expression of hatred? Because every distortion is a distortion of truth, and if we can align with the truth, things will ease, there's no need to self-judge, and the distortion can fall away more readily. Contemplate the nature of repulsion within the bigger picture - what value might that have? Consider two molecules that you force together under great pressure. If you push them hard enough, then you get nuclear fusion and a huge release of energy (more so that nuclear fission). I'd say it demonstrates how the universe is working to define itself within the manifest. I'd say it is the same with souls. For there to be relativity at all, each soul works to define itself as something different from another - something that is sovereign. Now contemplate a situation like the one you were - war time, where there was perhaps systematic atrocity by a group of people controlling society (like the Third Reich?). Suppose the person feels they must acquiesce and yet there's bubbling tension and rage because of the suppression - through the idea that it is too dangerous to say or do anything. If one had this kind of karma, it could easily manifest as rage. The question is, can you work to be sovereign and defined, expressive in your own vibe - connected, and yet clear of your boundaries. It could feel like attraction and repulsion at times. But in being self expressive, maybe then the rage can fall away - after you've let it out. But also remember, you're aiming for the karma underneath - which might only begin as a sublte vibration. So it would be important to sit with it and feel it. I would suggest the support of a facilitator if you need one. Let me know and I could recommend. I just took a few minutes to catch up on what I missed and I am happy to see that you are sharing your experiences and vulnerably sharing your challenges as we all can benefit due to the process being an evolution for each person and has an ebb and flow. The one thing that I would like to add, in support, is that the physical part of the process is, I think, the element that I was missing (or rather not attaching to) from the meditation/karmic release process. In the past, I have danced, done yoga, mediated, etc...but there was separation of activities. When we moved from deep meditation to slow movement to free movement (at whatever level you allowed yourself to become comfortable with) it created a flow for my soul. I was able to truly embody what the freedom from the attachment did for me...allowing myself to experience the physical release allowed me such a vast amount of joy and truly set me free, more than any individual activity did on its own in all of my previous practices. I recently joined a conscious free dance club in my home town and I found that many of them are interested in the breakthrough and meditation portion so that they can also experience the full process to what I have found such joyous freedom within. Hi Aproheidi - thanks for sharing your $0.02. It was of great value indeed! Yes indeed. Your own intuition will tell you what tools to apply and how. In the Breakthrough Approach, I tried to break things down into a simplified "first principles", really all around awarness and the stages of breaking through. But how you do it, and apply it, must be totally natural to each soul. Thanks AphroHeidi & Open for your last comments on this thread, which I know you wrote some time ago. It pains me to write this, but I need to pull back from the Openhand way of working for now, & concentrate on other modalities I’m using in my personal growth/spiritual development journey, which seem to be more aligned to my soul’s flow at this time. I identify with the Openhand process & philosophy a great deal, & I’m sure that I will be back before too long.